When you’re designing a workspace, you want to get everything right. So many factors, from paint color to lighting temperature, and from furniture arrangement to sound level, have an impact on workplace performance and the productivity of employees. In public spaces, such as restaurants, it’s important to lay out tables and seating and design the dining room to keep noise levels in check. You also want to separate certain areas, such as a private dining room for large parties or a more casual bar area for people who just want a drink or a quick bite. For a while, expansive open spaces were the preference for business owners, building owners and restauranteurs. Businesses that rent an open plan office can rearrange it based on their needs or the number of employees they hire. Building owners who rent out open place offices or other open layout spaces have more flexibility when it comes to finding tenants. Restauranteurs enjoy the freedom of setting up their dining areas however they’d like. Although the open plan layout has been trendy for a while, some business owners do want ways to divide up or partition off their space. Doing so creates private areas for employees who might need to take a phone call or have a confidential meeting. It also creates separate zones for certain activities. Clear glass walls and partitions help to delineate specific areas without completely closing down an open space. Should you want even more privacy, you can choose to add a finish to the glass. Glass finishes can improve an office or other workspaces by adding opacity to glass barrier walls or by incorporating a decorative touch, such as your brand’s signature color or logo. Several different types of glass finishes are available. 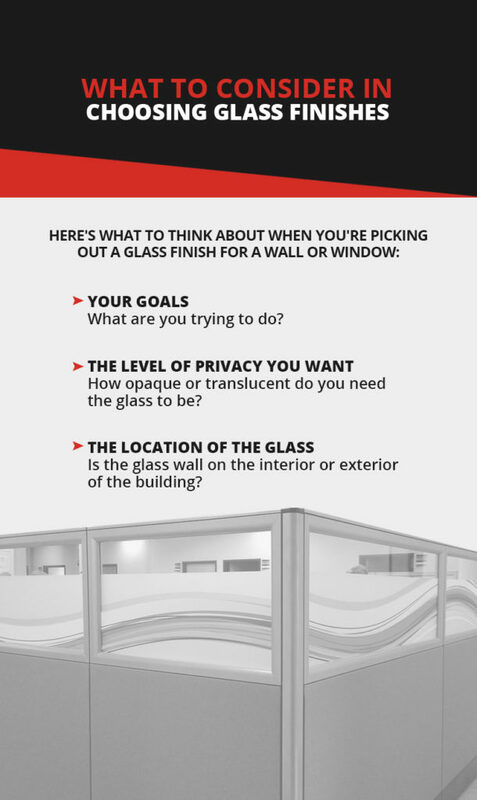 Learn more about each one, get ideas for using the finish in your place of business and then contact the experts at SpeedPro to see how we can help you use glass finishes to improve your office or workspace. If you’ve ever stepped into a bathroom with a window that let light in — but still obscured what was on the other side — then you’ve seen frosted glass in action. Frosted glass has a cloudy, foggy appearance. One way to think of it is as if someone decided to spread vanilla icing over the surface of a clear glass pane. Instead of cleaning the icing away entirely, they took a towel and rubbed it off, leaving behind a whitish residue. Acid etching: One way to frost a panel of glass is to apply a coating of hydrofluoric acid (or another type of acid) to the surface. The acid eats away at the glass, creating an uneven, bumpy surface on one side of it. The side that was treated with acid ends up being translucent, meaning light can get through, but people can’t get a clear view when they try to peer through the glass. How much the glass obscures what’s on the other side depends on how long the acid etches its surface. Sandblasting: Another way to frost a panel of glass is to sandblast it. Sandblasting glass involves using a high-powered machine that sprays tiny pieces of sand or walnut husks. The tiny particles hit the glass with such high speed that they abrade the surface, creating a rough texture on one side. Like with etched glass, light can still get through the sandblasted glass, but people can’t see through it. The speed of the sandblasting process and the size and quality of the abrasive material used influence how translucent the finished piece is. Applying a film: You can create the look of frosted glass without physically changing a panel of glass. Glass films adhere to a smooth glass surface to form a privacy barrier. Since many films are easy to remove, you can swap them out as needed. Whether you decide to use acid-etched, sandblasted or film-covered glass, you can cover as much or as little an area as you’d like. For example, you can choose to create a pattern on the glass, designing frosted circles or squares, or you can have your company’s logo etched or sandblasted onto a glass surface. Conference room walls: If your office’s conference room is located in the center of an open plan, using glass walls can separate it from the rest of the workspace. Using a frosted glass finish on those walls can keep curious individuals from looking inside the room during meetings and can also allow the people working in the space to avoid distractions. You can frost the entire surface of the walls or create a pattern on them that just obscures the view. Exterior windows of an office: Using frosted glass on the exterior window of a ground-floor office can keep curious passers-by from looking in. The glass can also help you avoid distractions by limiting your ability to stare out the window. Daylight can still come in through the window. Decorative signs on the exterior of a building: Frosted glass can do more than provide privacy. It can also act as a decorative touch. For example, you can have your company’s logo etched or sandblasted into a glass panel that’s used on the exterior wall of your building. You can also etch the logo into a glass door at the entrance of your office inside the building. Glass partitions in a restaurant dining room: Glass partitions can separate the bar area from a dining area or a private banquet room from the main dining room. You can choose to frost the entirety of a glass panel, etch or sandblast your restaurant’s logo into the glass or create a visually appealing design in the panes. A satin glass finish has some things in common with a frosted glass finish. Both are examples of glass that are opaque or that you can’t see through. Like etched frosted glass, satin glass is created by exposing a clear sheet of glass to hydrofluoric acid. Perhaps the biggest difference between satin glass and frosted glass finishes is their appearance. Satin glass, true to its name, looks smooth and silky. It’s also less shiny and more matte in appearance than other types of glass finishes. Like with frosted glass, you can achieve a satin glass finish by applying a film to a panel of plain, smooth glass. The thickness of the film determines how opaque the treated glass ends up being. The thicker the film, the harder it is to see through the glass. Partition walls at banks: Sometimes, people visiting banks need to sit down with a banker and discuss their finances rather than visiting the teller. Satin glass partition walls create a sense of privacy while maintaining the open flow and layout of a bank. Glass paneled doors: Glass panels built into doors can help light flow from a room on the exterior wall of a building into an interior area. Using satin glass panels in the doors can help create privacy without cutting off the light source to the interior space. Fitting rooms at clothing stores: Satin glass partitions can create a modern look in a store’s fitting room while still giving shoppers privacy as they try on clothing. Partitions at car dealerships: Satin glass partition walls create privacy for people who are in the final stages of buying a car and can separate the sales area from the busier sales floor. Reflective glass is plain, clear or tinted glass that has a metallic coating on one side. The metallic coating causes the glass to reflect light, creating a mirror effect. Depending on its thickness, reflective glass can act like a one-way mirror. People passing by on one side see themselves reflected. Meanwhile, people on the other side of the glass can look through it. Reflective glass works on both the interior and exterior of buildings. When it’s used on glass panels inside a building, it can help small rooms and areas look larger. Since it can reflect light, it can also help to brighten up places that were once dark or in shadow. On the exterior of a building, reflective glass can help to prevent heat gain and increase the energy efficiency of a building, at least in the summer months. Instead of absorbing the heat from the sun, the mirrored glass reflects it out. In stores: Since reflective glass can create a one-way mirror effect, one way to use it is to prevent or minimize shoplifting in stores. A glass panel can separate a back room from the central area of a store, and a security guard can keep an eye on the shopping area through the glass. On tall buildings: Reflective glass is often used on the facades of skyscrapers and other commercial buildings to increase privacy on the interior and minimize solar heat gain. In small office spaces: A mirrored surface that reflects light can make a small office space feel larger than it is. Glass doesn’t have to be clear. Tinted glass comes in a rainbow of hues, such as red, yellow, green and blue, as well as dark hues such as gray and brown. There are two ways to create tinted glass. One way is to add metal oxides or pigments to the glass itself, altering its color permanently. Another way to tint glass is by applying a tinted film over its surface. The glass film can be removed and changed based on the season or your decor preferences. Tinted glass comes with several benefits aside from adding visual appeal to a workplace. The color of the glass can increase privacy in an area as well, and it filters out sunlight and minimizes heat gain. As part of a mural: A colorful glass panel or two can add visual appeal to a mural. As an accent wall: An accent wall or partition that’s made up of colorful glass, such as a company’s or school’s signature colors, can be a stand-out piece of decoration in a lobby or other high-traffic area. In an office that gets too much sun: If an office receives a lot of sunlight — making it difficult for people to see during the workday — or if the sun causes the office to heat up too much, tinted glass can help to block the excess sunlight. In a store that gets a lot of sunlight: Tinted glass used in the windows of a storefront can minimize the amount of light that streams in, protecting inventory. Although frosted, satin, tinted and reflective glass finishes are often created by physically altering glass in some way, glass films can create a similar effect. These films are adhesive and firmly attach to smooth glass surfaces. Depending on your goals and the intricacy of your design, a glass film might be the best option for you. Films are available in a wide range of textures, colors and patterns. They can even be custom-printed with your company’s logo or brand name. For companies that are renting a space, one considerable benefit of glass films is that they’re removable. You can often peel them off and reuse them when you change offices or storefronts. Frosted, tinted, reflective or satin glass? A glass film? Which option is right for you? The type of glass finish that works best for your project depends on a few different factors. It’s also worth keeping in mind that you don’t always have to choose one finish over another. Depending on the project, multiple options might be right. Your goals: What are you trying to do? Is your goal to make an office or conference room more private, or do you want to add some decoration or visual interest to an area? Are you hoping to minimize heat gain in your building? The level of privacy you want: How opaque or translucent do you need the glass to be? Do you want people to be able to see through the glass from one side of the wall but not from the other? The location of the glass: Is the glass wall on the interior or exterior of the building? Whether you want to let light in: Do you want light to stream in through the window or wall, or are you hoping to block out as much of it as possible? Whether you’re trying to increase privacy in an open plan office, divide up a dining area in a restaurant or create an accent wall that shows off your brand and invites visitors to your company, you have lots of glass finish options to choose from. SpeedPro Imaging is a full-service communications studio with a myriad of colors, patterns, glass films and privacy options available. Find the SpeedPro studio nearest you and contact us today for a free quote.